Photo Credit: James McCafferty (left) courtesy of Loyola archives. James “Big Jim” McCafferty came to Loyola in 1938 to play football, but it was his accomplishments on the basketball court, as both player and coach, which will earn him a spot in the Allstate Sugar Bowl’s Greater New Orleans Sports Hall of Fame. The organization recently announced that McCafferty will join former NFL star Marshall Faulk and UNO volleyball player Javonne Brooks as the Class of 2011 inductees at the Greater New Orleans Sports Hall of Fame banquet on Saturday, July 23 at the Louisiana Superdome. McCafferty was recruited to play football for the Wolfpack, but switched to basketball after the university dropped football after his freshman season. He excelled on the hardwood, earning a spot on the All-Dixie Conference basketball team in 1941, leading the team in scoring both his junior and senior seasons, and was named Loyola’s best student-athlete in both 1941 and 1942. 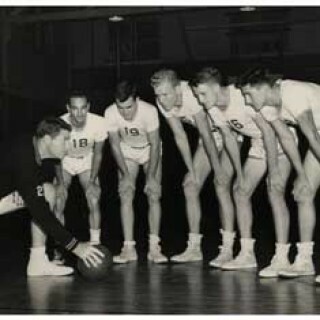 Upon graduating, McCafferty served as a basketball assistant coach for eight years under Jack Orsley, and was on the bench when Loyola won the 1945 NAIA National Men’s Basketball Championship. As head coach, he led Loyola to its only NCAA basketball tournament appearances, gaining one of 16 bids in both 1954 and 1957. In addition to his basketball duties, McCafferty was also the Wolfpack’s track coach and athletic director. Under his tutelage, Loyola athletes competed in the most prestigious track events in the country - the Drake, Florida, and Texas relays, and the NCAA Championships. His track team won consecutive Gulf States Conference Championships in 1951 and 1952. McCafferty left Loyola to become head basketball coach at Xavier University (Ohio) from 1957-63, winning 91 games and taking his team to the school’s first ever NCAA Tournament in 1961. He also served as the Musketeers’ athletic director from 1961-79 and was the first ever commissioner of the Midwestern Collegiate Conference in 1979. He died in 2006 at the age of 90. He is enshrined in both the Loyola and Xavier Athletics Hall of Fame.